Poppy's Lake is our 'runs water' where we maintain a very high stock of hard fighting carp offering the holiday angler the opportunity to enjoy a regular bend in the rod with carp from high singles through to 45lb or so The average size is in the region of 17lb-40lb but with the odd bigger fish up to mid 40's and we anticipate that our first Poppy's 50 will be coming through by the 2019 season. At the end of the 2016 season we drained and netted Poppy's Lake and removed a great many small carp as well as some catfish. The stock now consists of over 300 carp that will offer you some fabulous rod bending action. with a bottom comprised of silt over clay. 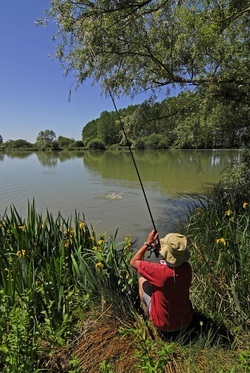 There are no nuisance species with the lake holding just carp, roach, pike plus the occasional tench. During the 2016 season catches of up to 200 carp was achieved, even when the anglers decided to fish just days. Action all the way at Poppy's Lake ! Poppy's Lake is above Etang du Mee and just a few minutes walk from the facilities. We are planning to install a composting toilet adjacent to the lake for emergencies but anglers usually are quite content to stroll down to the main shower/toilet block. It is a very quiet venue and a real sun trap where other than song birds and the drone of dragonflies the only other noise to be heard may be a distant tractor. In the spring there is always a cuckoo to be heard around the lake and the summer months see kingfishers and even the occasional roe deer can be seen coming the the lake edge for a drink. Badgers and foxes also live close by in our woodland and will often be seen or heard in the nights or early mornings.